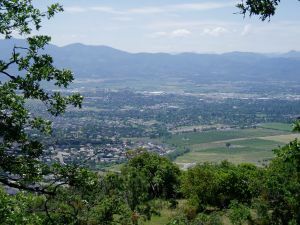 Prescott Park is located adjacent to the eastern boundary of the City of Medford on Roxy Ann Peak. The peak, with an elevation of 3,571 feet, is a dominating geographic feature that stands well over 2000 feet above the valley floor and the City of Medford. A panoramic view of the Rogue River Valley and surrounding countryside can be enjoyed from its heights. The Medford Lion’s Club began the acquisition of park land in 1929 with the purchase of 200 acres, which was donated to the City of Medford in 1930. The City acquired the rest of the 1,740 acres from the U.S. Government by 1933 with the stipulation that it be used for recreational purposes only. The name Prescott was soon added in memory of George J. Prescott, Medford Police Officer and Jackson County Constable who was killed March 16, 1933 in performance of his duty and who had been an enthusiastic supporter of the Park. Early developmental work in the park was completed as part of various federal work programs during the late 1930s, primarily by the CCC (Civilian Conservation Corps). These efforts were guided by a master plan developed by the National Park Service which envisioned a series of scenic overlooks, picnic areas, hiking trails, and related day-use facilities. The overall concept was, in the style of the period, rustic and pastoral. The management plan for this 1,740 acre park was updated in 2007 and adopted by the City Council in 2008. The update to the plan was a result of community input on the items residents would like to have added and preserved in the park. The two main features that are part of the Management Plan are to construct a parking area and expand the trail system within the park. The Parks and Recreation Department contracted with the International Mountain Bicycling Association – Trail Solutions Program to review the park and develop a listing of conceptual trails for possible construction. This plan was presented to the Parks and Recreation Commission in October 2013 and approved by the Medford City Council in January 2014. The trail plan identifies an estimated 34 miles of multi-use trails for either rehabilitation or new construction. The estimated total cost for construction of all four phases and 34 miles is $750,000 (2015). Once completed, the Prescott Park Trails will become not only an opportunity for our local population to experience a first class facility, but could also become a host site for regional and national cycling and trail running events. These types of events will provide an economic benefit to Medford, much like U.S. Cellular Community Park has become.